CHRISTIAN READER,—After the foregoing address, I need not put thee to much more trouble: only I shall say, that he must needs be a great stranger in our Israel, or sadly smitten with that epidemic plague of indifferency, which hath infected many of this generation, to a benumbing of them, and rendering them insensible and unconcerned in the matters of God, and of their own souls, and sunk deep in the gulf of dreadful inconsideration, who seeth not, or taketh no notice of, nor is troubled at the manifest and terrible appearances of the inexpressibly great hazard, our all, as Christians in this life, is this day exposed into. I mean the mystery of the gospel of the grace of God, wherein the exceeding riches of his grace, in his kindness towards us, through Christ Jesus, hath been shown. We have enjoyed for a considerable time, a clear and powerful dispensation hereof, in great purity and plenty; but, alas! is it not manifest to all, that will not wilfully shut their eyes, that this mercy and goodness of God hath been wickedly abused, and the pure administration of his grace and love perfidiously sinned away, by this apostate generation. Are our spots this day the spots of his children? Are their fruits answerable to the Lord's pains and labour about us, to be seen even amongst the greatest of professors? Is there that gospel holiness, tenderness, watchfulness, growing in grace, and in the knowledge of Jesus Christ, that growing up in Christ, in all things that heavenly mindedness, that fellowship with the Father and with his Son Christ Jesus, and that conversation in heaven, that the dispensation of grace, we have been favoured with beyond many, and have been long living under, did call for at our hands? Alas! our grapes are but wild and stinking. Wherefore (and who can think it strange, if it be so?) the Lord seemeth to be about to contend with us, by covering our horizon with Egyptian darkness; many who would not receive the love of the truth, that they might be saved, being already given up to strong delusion, that they should believe a lie, and many more in hazard to be drawn aside to crooked paths, by men of corrupt minds, who have been, and are still busy to vent and spread abroad, with no little petulancy and confidence, damnable doctrines, to the perverting of the doctrine of the gospel of Jesus Christ, and to the subverting and overturning of the very foundations of our hope and assurance; and that in such a way, and by such means and stratagems, as seem to have wrath written upon them in legible letters; for the more plausible and taking a corrupt doctrine be, it is the more dangerous and judgment-like, and more are thereby in hazard to be deluded and drawn away. Nay (which is yet more terrible and dreadful) it is to be feared, that the jealous God, in his holy and righteous judgment, hath given a providential commission (to speak to) unto the seducing spirit, to persuade and prevail; for is not this the clear language of the present holy and righteous dispensations of God, and of the stupendously indifferent frame and disposition of the generality of men, called Christians, not only provoking God to spue them out of his mouth, but a disposing them also unto a receiving of whatsoever men, lying in wait to deceive, shall propose and obtrude? That sure the consideration of this should move all, in whom is any thing of the zeal of God, and love to souls, their own and others', to appear in the defence of the gospel of our salvation, by all means incumbent to them, and possible for them; for if this citadel and stronghold, wherein our all, and the all of pure and true religion, lyeth, be blown up, we are gone; and indeed no less is intended by this antichristian and antievangelic enemy, than the utter subversion of true Christian religion. Who would not then be hereby alarmed, and upon their guard, when matters are at this pass? Should not all, who have any love to their own souls, any zeal for the glory of Christ, anointed of the Father to be our prophet, priest, and king; my desire to see the crown flourishing upon his head, and to have the gospel preserved pure and uncorrupted, be pleading with God by prayer, in the behalf of his Son's kingdom, crown, and glory; and wrestling with him till he were pleased to dispel these clouds, and prevent this black day: especially should they not be labouring to be acquainted, in truth and reality, with the gospel of Jesus Christ, that having the mysterious truths thereof imprinted on their souls, and their hearts cast into its mould, they may be preserved from the hurt of this deadly poison; for this, with a constant dependence upon, and use-making of Christ in all his offices, will prove the best preservative against this infection. The persuasion whereof did induce me to publish the following heads of some sermons, after they have been translated into Dutch, and published here: Knowing that they might be of no less use to the people of God in Britain and Ireland. I know not a more effectual mean to unstable souls from siding with and embracing every new notion; and from being carried about with every wind of doctrine, by the slight of men, and cunning craftiness, whereby they lye in wait to deceive; than to put them upon the real exercise of gospel godliness, and to the daily practice of the main and fundamental gospel work, of living by faith in Jesus Christ, and of growing up into him, in all things, who is the head, from whom the whole body fitly joined together and compacted, by that which every joint supplieth, according to the effectual working in the measure of every part, maketh increase of the body, unto the edifying of itself in love. Such, I am sure, as have thus learned the truth, as it is in Jesus, and are practising the same accordingly, will have an antidote within them against the strongest poison of these seducers, and a real answer to, and confutation of, all their subtile sophisms. The soul exercising itself into gospel godliness, will find work enough to take it wholly up; and find such a solid ground to stand upon; and see such a satisfying fulness, answering all its necessities and wants, and such a sure heart-quieting ground of peace, hope, and consolation in Jesus Christ, as that it will have no leisure, and small temptation to listen to seducing perverters, and no inclination to seek after empty cisterns. I know much may be desiderated in this following treatise, and many may have exceptions not without ground against it. Some may think it arrogancy, and too great confidence in me, to attempt the handling of such a mysterious and necessary part of Christian practice, wherein few, (if any, so far as I know,) have gone before, in direct handling of this matter, at least in this method and order, I mean that part which is about sanctification. Others may be displeased with the mean and low style; with my multiplying particulars, which might have been better and more handsomely couched under fewer heads, and with my unnecessary contracting of the whole into such a narrow bound, and other things of that kind; for which, and many other failings of the like nature and import, which may without any diligent search, be found in it, even by ordinary and unprejudiced readers; I shall not industriously labour to apologize, knowing that my very apology in this case, will need an apology; only I shall say this, that considering how the snare, which the vigilant and active enemy of our salvation, the devil, was laying by an unholy morality, did nearly concern all, and especially the meanest (for parts and experience) and less fixed Christians, I thought a discourse on such a subject as I judged most necessary at all times, and especially in such a day of hazard, should be framed to the capacity of one as well as another; the most understanding can receive benefit, by that which is calculated to the capacity of children, when these can reap little edification by what is suited to the palate of those; and the less experienced, or such as are of lower understanding, will be less able to draw a general to a particular; or to improve and so fully to comprehend one particular touched, as to be able thereby to understand and take in a like particular not mentioned; than such as have their senses more exercised, and are thereby in case to make a better improvement of what is but compendiously declared, when those must have the bread broken to their hand, or they shall receive but small edification thereby; and yet, I suppose, the judicious will observe some variety, smaller or greater, even where particulars seem to be, at the first view, most unnecessarily multiplied. I know, and willingly grant, (for it is obvious enough) that a discourse of this subject and matter, might have required a far larger volume; but then how should such have profited thereby, whom poverty might possibly have scared from buying; or the necessary affairs of their ordinary callings would have keeped from a diligent perusal of it? And I thought that neither of these should have been overlooked in this special or general design which I had before my eyes. One thing, as my answer to all, I shall but add; if hereby others whom the Lord hath more enabled with all necessaries for such a work, shall be hereby either instigated or encouraged to write upon this subject, (I mean mainly the last part thereof, touching the use-making of Christ in sanctification; for blessed be the Lord, many have been employed of the Lord to speak soundly and edifyingly unto the use-making of Christ as to righteousness and justification,) a full, plain, edifying and satisfying discovery of this necessary and important truth, viz. Christ made of God to us wisdom, righteousness, sanctification, and redemption. And withal, point out plainly and particularly the way how believers in all their particular and various exigencies may and should so make use of and apply that all fulness which is treasured up in the Head, for the benefit and advantage of the members of the mystical body, as they may not only theoretically see, but practically also experience this truth, that in him they are complete; and so they may be helped to understand how through the necessary and constant use-making of him, as all in all, they may grow up in him in all things. If this be, I say, done by any to better purpose, I shall think this my adventure not altogether fruitless, and in part at least excusable. Know then, that there are certain men (as the Apostle Jude speaketh) crept in unawares, who were of old ordained to this condemnation, ungodly men, turning the grace of our God into lasciviousness, and denying the only Lord God, and our Lord Jesus Christ; for in these last days we see that these perilous times are come, (of which Paul advertised Timothy, 2 Tim. iii. 1, &c.) wherein men shall be lovers of their ownselves, covetous, boasters, proud, blasphemers, disobedient to parents, unthankful, unholy, without natural affection, truce-breakers, false accusers, (or make bates) incontinent, fierce, despisers of those that are good, traitors, heady, high-minded, lovers of pleasure more than lovers of God, having the form of godliness, but denying the power thereof—for of this sort are they which creep into houses, and lead captive silly women, laden with sins, led away with divers lusts, ever learning, and never able to come to the knowledge of the truth. And because it is so, he exhorteth to give diligence to make your calling and election sure, by giving all diligence to add to faith virtue, to virtue knowledge, and to knowledge temperance, and to temperance patience, and to patience godliness, and to godliness brotherly kindness, and to brotherly kindness charity, for if ye do these things, ye shall never fall. As the Apostle Peter assureth us, 2 Peter i. 5, 6, 7-10. For it is the elect who are secured from full and final defection and apostacy, Matth. xxiv. 24. Mark xii. 22. Rom. xi. 5, 6; ix. 11; viii. 33. Matth. xxiv. 31. Mark xiii. 27. And the promise of salvation is made to such as shall endure to the end. The crown is for the overcomers, and such as are faithful to the death, Matth. x. 22; xxiv. 13. Mark xiii. 13. Rev. ii. 10, 11, 17, 26, 27, 28; iii. 5, 12, 21. All which, and the like, are set down, that hereby his people might be rationally moved to a constant seriousness, in the working out of their own salvation, in fear and trembling; and the forewarnings given of the great difficulty of the reaching the end of our faith, the salvation of our souls, because of the many active, vigilant, indefatigable, subtile, and insinuating adversaries, who by good words and fair speeches, will readily deceive the hearts of the simple, and to awaken the more his people to be sober and vigilant, because their adversary the devil (who acteth and moveth his under agents, in their several modes, methods and motions, so as he may best, according to the various tempers, present dispositions, advantages or disadvantages of such as he intendeth to seduce, which he carefully studieth, and plyeth for this end, obtain his designed end, their ruin and destruction) as a roaring lion, walking about seeking whom he may devour. And this calleth them to haste out their slumber and security, who will be loath to miss his opportunity, surprise them to their great loss and disadvantage. It is, beloved, high time now to awake, to look about us, to consider where we are, upon what ground we stand, whether the enemy or we have the advantage, how and in what posture we are to rencounter with deceivers that seek to cheat us out of all our souls, and of the Lord our Righteousness, and draw us off the paths of life, that when we come to die (beside the unspeakably great loss we would thereby be at, even here, in missing the comfortable accesses to God through Jesus Christ the inflowings of grace and strength for spiritual duty through the Lord our strength; the sweet communications of peace and joy in the Holy Ghost, the shedding abroad of the love of God in our hearts by the Holy Ghost, which is given unto us, and the full assurance of hope through the Lord Jesus our hope) we might be frustrated of all our expectations; and find, that all that which men made us grip to, lay hold on, and lean unto, instead of Christ, was but a mere shadow, and a lie in our right hand, to the unexpressible grief, vexation, and sorrow of soul when all should end in a dreadful and horrible disappointment. But let us not think that our purposes, firm-like resolutions to adhere to the truth, and our present abhorrence at, and detestation of errors now broached, to the overturning the very foundations of true Christianity, will sufficiently guard us from, and make us proof against the shots and assaults of these crafty seducers. Nor think, that our learning and knowledge in the theory of the truth; nor our abilities to rencounter sophisters, will secure us from a fall; let us not think that the enemies are contemptible, and therefore we need be the less anxious, nor yet think that former experiences and through-bearings, in the like cases, will be a pillow, whereby we may now lay ourselves down to sleep. If we do, we shall certainly deceive ourselves, if all our strength and standing be in ourselves, and through ourselves; and if this be the ground of our hope, the righteous Lord in his holy justice, may give us up to be a prey. Peter's instance should never be forgotten by us; and such as tempt the Lord have no ground to expect his last issue. Our strength must be in Christ: to the rock of ages must we fly: to our chambers in him must we retire, and there must we hide ourselves: on Christ's lee-side can we only ride safe, and be free of the hazard of the storm. To him therefore must our recourse be daily, by new and fresh acts of faith in and through him and his influences, communicated according to the tenor of the covenant of grace, through faith eyeing the promiser, the promise, with the price purchasing, and so drawing and sucking light, direction, strength, stability, and what our present exigent calleth for, must we think to stand. And happy they who, conscious to themselves of their own weakness, and convinced of the insufficiency of all things within them, in godly fear hide themselves under the wings of the Almighty, and get in into this stronghold, resolving there to abide, and there to be secured from all their adversaries, within or without. These humble fearers may expect a safe and noble outgate; when more strong-like and more confident adventurers shall (being left to themselves, because trusting in themselves), shamefully fall, and be triumphed over by the enemy, to the grief of the godly, and for a snare to others. The best way then, to keep the faith of Christ, which many are now seeking to shake and to loose us from, is to be exercising the faith of Christ. The serious and upright practising of the gospel is the only best mean to keep thee firm in the profession of the gospel, when the gospel with thee is not a few fine notions in the brain; but is heavenly and necessary truth sunk into the heart, and living and acting there; it will keep thee, and thou wilt own it more firmly and steadfastly in a day of trial. Thy walking in Christ, and working and living, by him living in thee, will so root thee in the gospel truth, that enemies will pull in vain, when seeking to overthrow thee. The gospel of the grace of God received and entertained in thy soul in love, and constant suitable improvement, will fortify thee, and secure itself in thee, so that vehement blasts shall but contribute to its more fixed abode, and more fruitful actings in thee. Live up then to the gospel, and so be sure of it, and be safe in it. I mean, let Christ live in thee as thy all, and cast all thy care and cumber on him; lay all thy difficulties before him; lean all thy weight upon him; draw all thy necessities out of him: and undertake all thy duties in him; be strong in him, and in the power of his might; let him be thy counsellor, conductor, leader, teacher, captain, commander, light, life, strength, and all, so shall thou stand and have cause to glory, even in thine infirmities, for thou shalt find the power of Christ resting upon thee, and thou shalt have cause to say, therefore I take pleasure in infirmities, in reproaches, in necessities, in persecution, in distresses for Christ's sake; for when I am weak, then am I strong. Remember that great word, Phil. iv. 13, "I can do all things through Christ, which strengtheneth me." CHAPTER I. Introduction, with some general observations from the cohesion. CHAPTER III. How Christ is the Way in general. "I am the Way." CHAPTER IX. How to make use of Christ for cleansing of us from out daily spots. CHAPTER X. Some generals proposed. CHAPTER XI. More particularly in what respect Christ is called the Truth. 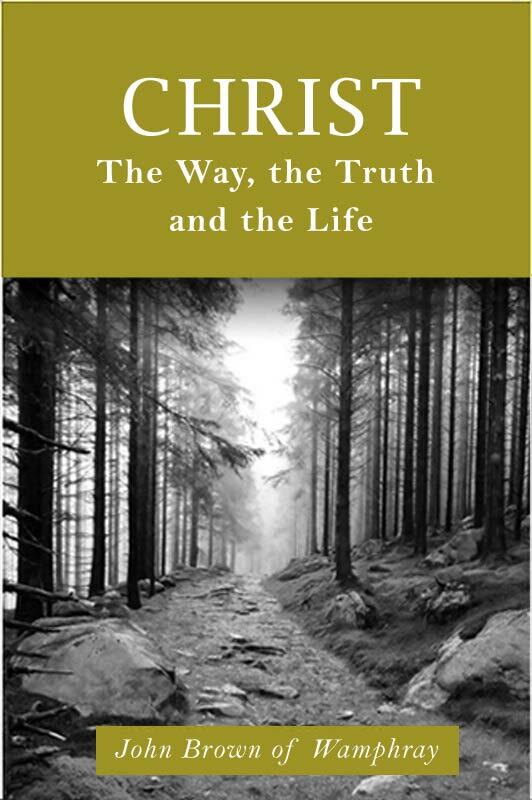 CHAPTER XIV.How to make use of Christ, as Truth, for comfort, when truth is oppressed and borne down. CHAPTER XV.How to make use of Christ for steadfastness, in a time when truth is oppressed and borne down. CHAPTER XVII.How to make use of Christ as the Truth, that we may get our case and condition cleared up to us. CHAPTER XIX. "And the Life." How Christ is the Life. CHAPTER XXIII. How to make use of Christ as the Life, when the soul is dead as to duty. CHAPTER XXIV.How shall the soul make use of Christ, as the Life, which is under the prevailing power of unbelief and infidelity. CHAPTER XXV How Christ is made use of as the Life, by one that is so dead and senseless, as he cannot know what to judge of himself, or his own case, except what is naught..
CHAPTER XXVI. How shall one make use of Christ as the Life, when wrestling with an angry God because of sin? CHAPTER XXVII. How is Christ, as the Life, to be applied by a soul that misseth God's favour and countenance.